Fleas are are wingless insects with mouthparts adapted for piercing skin and sucking blood. Fleas are external parasites, living by hematophagy off the blood of mammals (including bats and humans) and birds. Some flea species include:Cat flea, Dog flea, Human flea, Northern rat flea, Oriental rat flea.Over 2,000 species have been described worldwide.Their legs are long and adapted for jumping: a flea can jump vertically up to 7 inches (18 cm) and horizontally up to 13 inches (33 cm). This is around 200 times their own body length, making the flea one of the best jumpers of all known animals (relative to body size), second only to the froghopper. The flea body is hard, polished, and covered with many hairs and short spines directed backward which also assist its movements on the host. The tough body is able to withstand great pressure. Even hard squeezing between the fingers is normally insufficient to kill a flea. It is possible to eliminate them by pressing individual fleas with adhesive tape or softened beeswax (or "cheese" wax) or by rolling a flea briskly between the fingers to disable it then crushing it between the fingernails. Fleas also can be drowned in water and may not survive direct contact with anti-flea pesticides. 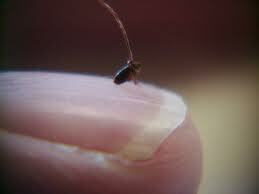 Young adult fleas live only about one week if a blood meal is not obtained. However, completely developed adult fleas can live for several months without eating. Fleas attack a wide variety of warm-blooded vertebrates including dogs, cats, humans, chickens, rabbits, squirrels, rats, ferrets, and mice.Fleas can settle in a person's hair in less than ten minutes, causing soreness and itching.Since more than three quarters of a flea's life is spent somewhere other than on the host animal, it is not adequate to treat only the host; it is important also to treat the host's environment.Combatting a flea infestation in the home takes patience because for every flea found on an animal, there could be many more developing in the home. A spot-on insecticide will kill the fleas on the pet and in turn the pet itself will be a roving flea trap and mop up newly hatched fleas. The environment should be treated with a fogger or spray.